Unique is the first word that comes to mind when describing this book. The second would be refreshing, it was refreshing to read such a unique story. I love the quirky nature of Coinman, he was entertaining and fun. I loved the storyline and the issues dealing with his co-workers as well as his wife. I think that this story holds its own in the story world and I cannot sit here and say "oh yah I have read this story before" I really think most people who like to get outside the comfort zone and try new stories will really enjoy this one of kind book. 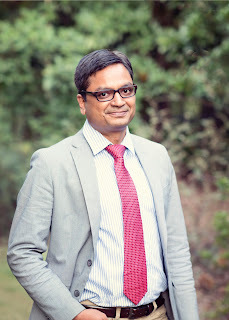 Pawan Mishra is a leader in the technology and finance industries. He completed his education at the Indian Institute of Technology, Kanpur. He spent the first eighteen years of his life in the small town of Aligarh in India and discovered his love of storytelling, reading, and writing during this time. This debut novel, Coinman, tells the story of the protagonist's peculiar habit and the incredible animosity it provokes in the people around him. It all began with high expectations. I couldn’t believe at first that Sage Mangal, our esteemed master at the ashram, whose personality I can’t promise to make you very familiar with, had trusted me with a task of such ambition. “A lack of emotional engagement in the affair affirms higher credibility,” Sage Mangal had explained when asked why he chose me, Sesha, over many others, for pulling the pieces of Coinman’s story together after the latter’s departure from the ashram. In short, it was the lack of my prior acquaintance with Coinman that had won me this prize. His Politeness also bestowed me with the divine power to find almost everything that I needed to find. Such was this power that I could enter invisibly into past situations, could be at multiple places at the same time, and could even float in someone’s mind without their discovering. Before you ask, Sage Mangal did meticulously bar my access to certain activities and places—for example, the bathroom where one of the main characters in our story spent a major part of his life. The sage agreed in advance to bear with any compromises that my lack of full access might potentially introduce to the story. I could ramble on forever, but this is all I wish to convey to you about me and my job. I will assume that you wouldn’t want to know more than that either; not only will it make my job simpler, but it will also fulfill my wish to remain largely invisible. Honestly, with the kind of story I am about to embark on, I know you couldn’t care less about me. So let’s get to the story without further ado. Jangle jingle! Clink clatter! Ding-a-ling! Ring-a-ding! The mind-numbing sound of relentlessly jingling coins was something the people of the office, the center stage of this story, hadn’t quite learned to live with yet. Not only when the possessor of the busy coins, Coinman, walked, but also when he stood talking—or engaged himself in doing anything else, for that matter—his left hand constantly fondled the coins with tenderness. The coins occupied an eternal place in the left pocket of his trousers and, regardless of where he dwelt or what he did, constantly slithered through the narrow spaces between his fingers. When an activity adamantly demanded participation from one of his hands, he strategically let the activity claim his right hand to allow the left one an uninterrupted opportunity for the recreation. If such an activity insisted on his left hand, he transferred the coins to his right pocket ahead of time to allow his right hand to continue feeding his mind. Once the exceptional engagement was over, the left hand impatiently looked forward to the return of its possession. If there was a momentary delay, the left hand hurriedly tried to enter the right hand’s den, making the coins feel nervous, just as a princess would on seeing two equally adept princes fighting to claim her hand. When an activity required continuous use of both hands, like welcoming a delegation from another firm with garlands, he tackled such desperate scenarios by the means of a last-minute absence. There were rare yet difficult off-the-cuff occasions, too, when it was unavoidable that he stop the action in his pocket, such as a sudden request to hold a big chart with both hands for a few minutes for a colleague’s presentation. Faced with such calamity, he immodestly excused himself for biological breaks, which, despite not fooling anyone, did not provide anyone enough justification to raise an official protest. The office was located in a small town somewhere in northern India; in a four-story building where it occupied the second floor, where all the managers sat in private offices, and the first floor, where the rest of the staff sat at desks in a large open hall. 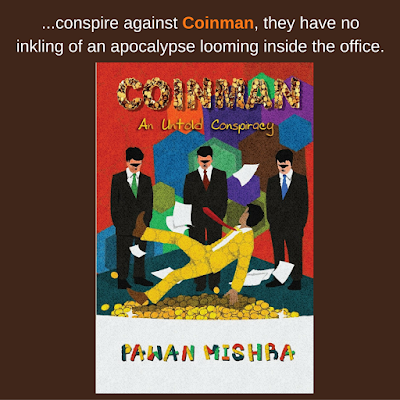 Far back in time, beyond a recall of the exact date, unable to put up with Coinman’s interminable daylong feat, colleagues at neighboring desks had started shifting their positions away from him; inch by inch, each day. It caused some sort of a ripple effect throughout the entire arrangement. The staff, without a spoken word, synchronized the move, over several months, with such a constant and slow pace that it was hard to spot it at any given point. When Coinman first spotted the continuous movement, he stayed calm initially, for he wanted to observe for a few more days to confirm his findings. Past embarrassments from his premature findings had left him wiser. Satisfied with the constancy of the move, he felt comfortable loudly announcing its progress every day to his neighbors. The minute he reached the office, he threw his bag on his desk, flew to nearby desks with the wings of curiosity, and bent down to take notes on the tiny spiral-bound notebook that he carried in his shirt pocket. Spiral-bound notebooks did not misbehave during his right-hand-only writing endeavor the way the sewn or case-bound notebooks did, like closing repeatedly without support from his coin-engaged left hand. The futility of Coinman’s verbal attempts to convince his neighbors about the unfaltering motion of the desks made him carry a small measuring tape and a white chalk to mark the daily progress. At the end of each day, before leaving the office, he marked the location of each neighboring desk by drawing boundaries around its feet, accompanied by a date and time. He did the same on the following morning, as soon as he came to the office. He realized within a few days that one of these two marks was redundant but wasn’t quite sure which one. He decided to continue only with the morning mark. But that did not solve the issue entirely. Since the desks were moving extremely slowly, two consecutive marks still overlapped with each other. To crack this challenge, he started bringing high-quality thin marker pens. The hard-nosed desks had to accept defeat and move visibly thereafter. “There, you see? That mark. This one, right here. Look at the overnight distance. God!” he would exclaim, flying from one desk to other, pining for his colleagues’ approval. Seeing no impact on his cold colleagues, he saw no point in trying to win them over. He started removing marks from the previous day while adding the new ones in the morning to continue tracking the direction of the movement for his own record. Ratiram, the reservoir of wisdom, the most widely revered man among the first-floor inhabitants, had been discreetly keeping an ardent eye on the move. He was one of those who are not born handsome, but develop charming features with age by continuously engaging their brains with intelligent thoughts.